A few interesting mid-week updates for those following ProcessWire 2.5 development (aka the dev branch). Default: A minimal responsive site profile that serves as a good starting point for new sites or for learning about ProcessWire. Classic: This was the default site profile from ProcessWire versions 2.0 through 2.4. While now a little older in appearance, it is a great starting point for learning about ProcessWire. Blank: This profile includes only the bare minimum pages, fields and templates, giving you essentially a blank slate. If you want to create a new profile for the installer, just use the new profile exporter (described further down). Older/existing site profiles should work too. Ability to export profile to ZIP file that you can download. It now creates ready-to-go site profiles, needing no additions or modifications. 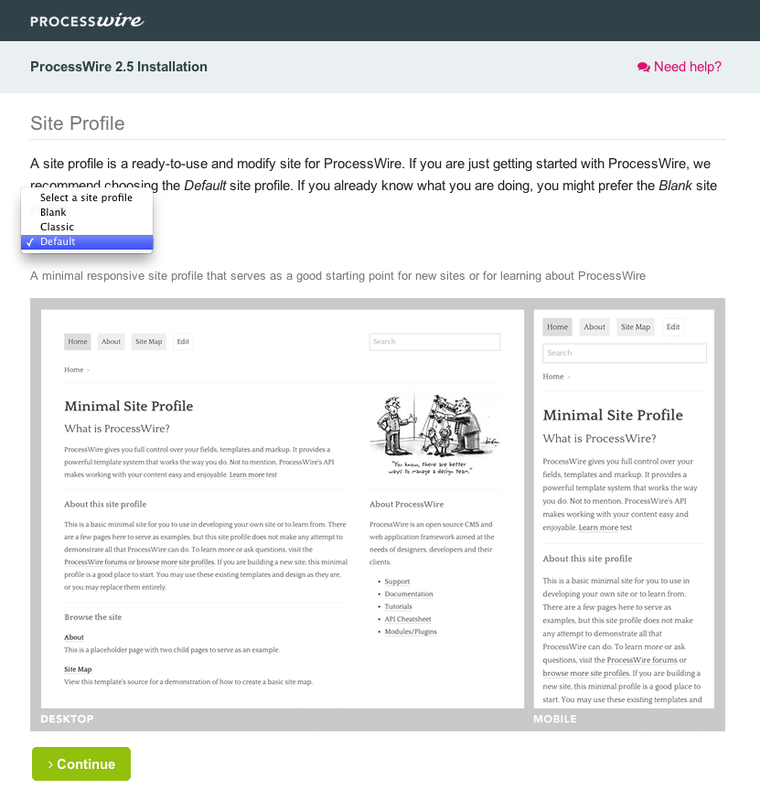 Simply unzip the profile onto your server where ProcessWire is located, and ProcessWire's new installer can install it. Support for profile meta data including title, summary and screenshot image. 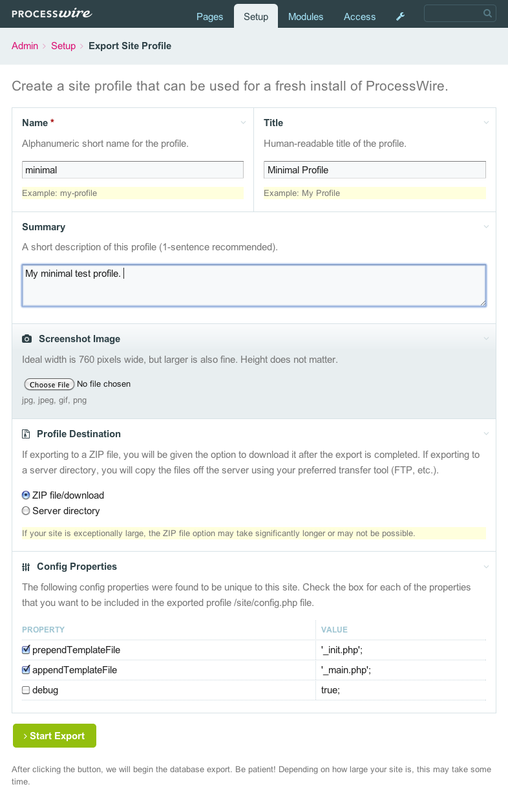 Selective config.php export: you now have checkboxes to choose which site/config.php properties you want to end up in the profile. Uses ProcessWire's new WireDatabaseBackup class to handle the export (while PW's new installer uses it to handle the import). The new profile exporter is available as the dev branch of the existing profile exporter. 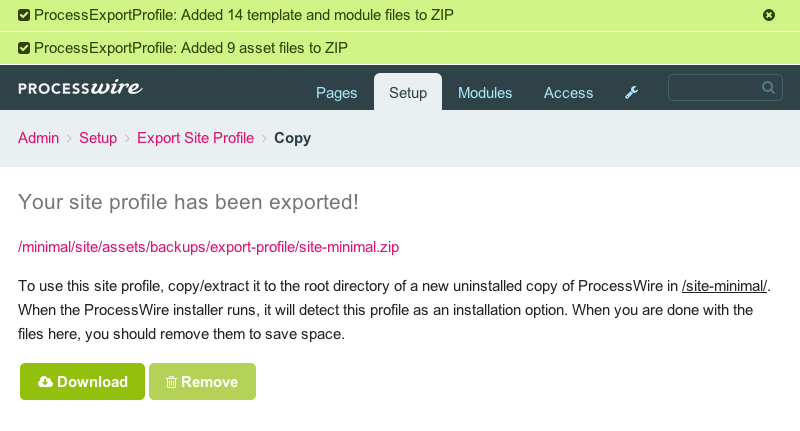 If you want to give it a try, grab the latest ProcessWire dev version (2.4.15) and Download ZIP of the new profile exporter. You may already know about the $config->prependTemplateFile and $config->appendTemplateFile options available in the /site/config.php file. 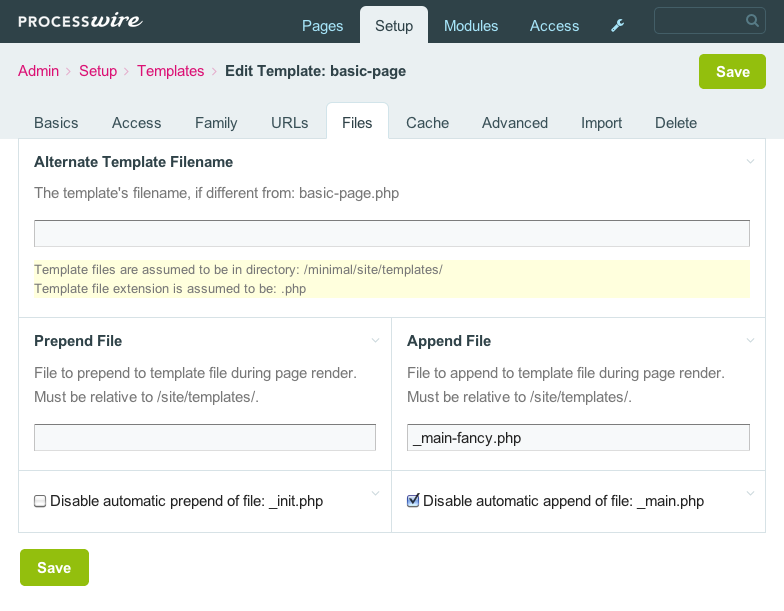 They are used by a lot of site profiles, and they do what their name implies: prepend or append another file to all of your site template files. As you can see in the screenshot above, these new options live under a new "Files" tab in the template edit screen.